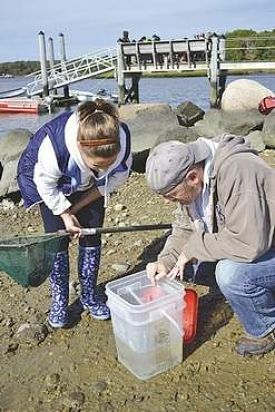 DARTMOUTH — On the chilly morning of Oct. 12, there were fifth-grade students from Dartmouth gasping in excitement, barely able to contain themselves, over the chance to pick and eat something called a sea pickle, a salty and slightly bitter edible plant that grows along the salt marshes of the Slocum River. The Turn-the-Tide Educational Program at the Lloyd Center for the Environment is a field trip that David Finn-Clarke, a teacher at the DeMello Elementary School, says his fifth-grade students attend every year. The program was piloted in 2003 and has been integrated into the Dartmouth Public Schools’ fifth grade curriculum ever since. The DeMello School students raised and waved their hands wildly when Lloyd Center Intern Erika Fernandes asked for a volunteer to take a core sample of the salt marsh to determine its age, and then watched in anticipation as a classmate used all of his might to drive the measuring device deep into the rich soil of the marsh. Upon examining its distinct layers, the students responded with amazement at the 850 years represented in the core sample. The students took turns using the scientific equipment that determines water quality, learning about the importance of the estuary while making a real connection to the estuarine habitat. There was hardly a dull moment. Wading through the waters of the tidal mud flats was an obvious favorite activity, setting the students free to fish for mud flat species like crabs, baby shrimp, and small fish. Youngsters with green fishing nets stepped cautiously through the shallow, rocky waters while others splashed their way back to the shore where buckets of water waited to be populated with sea creatures captured by the students. Except for the unfortunate few who missed their step and flooded their boots with water, the students were blissfully oblivious to the cool, crisp autumn morning air that prompted parents to send their children to school in jackets and winter hats that day. In 2002, the Lloyd Center partnered with the Town of Dartmouth, the UMass Dartmouth School of Marine Science and Technology (SMAST), and the Coalition for Buzzards Bay in a project called Turn-the-Tide to help restore and protect the estuaries of the Slocum River. The Lloyd Center implemented the educational curriculum based on the Turn-the-Tide research project to give students a better understanding of local habitats and the importance of preserving and protecting them.